Many of us try to use natural products and materials in our daily lives and this is especially true when it comes to choosing your body jewellery. 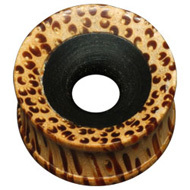 Most people find that natural materials work best for their stretchings, which is why our wooden flesh plugs are so popular. Wood is an excellent material for flesh plugs because it is biocompatible and seems to exist in harmony with your body. It reduces odour and irritation, so your stretchings will feel great. 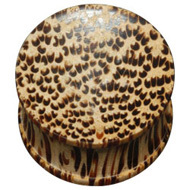 Wooden flesh plugs also look wonderful and come in a choice of gorgeous colours and natural patterns. 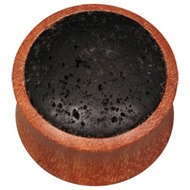 These wooden flesh plugs are suitable for fully healed stretchings only, so I recommend stretching with surgical steel tapers and then switching to wooden jewellery once the stretch has healed. Carved from a single piece of wood, our one-piece wooden flesh plugs show off the natural beauty of the wood. They are made from wood chosen for its fine colour and sustainability. 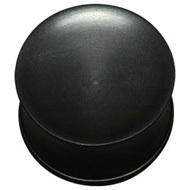 We have a great choice of these flesh plugs and as you can see, they are very beautiful. The natural colours and textures look lovely against your skin and add an element natural simplicity to your style. For something more striking, check out our inlaid and mixed wood flesh plugs. 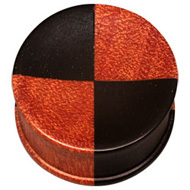 These plugs feature two or more types of wood and make the most of the natural variation in colour and pattern. They make a statement and draw attention to your stretchings, perfect for showing them off. This entry was posted in Stretching Jewellery, Wood Body Jewellery and tagged Natural Flesh Plugs, Organic Flesh Plugs, Wood Flesh Plug, Wood Flesh Plugs, Wood Stretching Jewellery, wooden flesh plug, Wooden Flesh Plugs, wooden jewellery, Wooden Stretching Jewellery on March 29, 2013 by Piercing Guru.